It was a really good that Tim Krul managed to get a loan spell at Dutch club AZ Alkmaar last night so his nightmare at Ajax is finally over. In retrospect that was the best deal Newcastle accomplished in January. It’s got to be hard on any top player when you sustain a very serious injury playing for your country and then you go on loan to one of that country’s top clubs and you are not given one chance to play in the first team. And Tim is an experienced and mature player who will now move on and go all out to get the first team jersey at Alkmaar and certainly the club seem delighted to have got him in on loan. The good news is that with so many games AZ Alkmaar have to play he will get a good number of games before the end of the season. 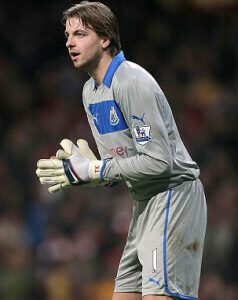 The plan this season was for Tim Krul to go out on loan and then join Newcastle for pre-season this summer. Then Rafa would have to make a decision on who to sell between Tim, Rob Elliot, Matz Sels and Karl Darlow. And we also have young Freddie Woodman on loan at Kilmarnock, although Freddie may be sent out on loan next season – maybe to a Championship side so he can get lots of games which he needs for his continuing development. Tim has 18 months left on his contract and although it may be probable he will be sold in the summer, it’s certainly not a forgone conclusion, especially if he gets back to his previous top form this season at Alkmaar. That’s what we’re hoping for. Disappointed with losing to Oxford, but happy with the team Rafa put out – majority thought we had a strong squad, so why was this team not capable of winning- poor defending from corners and poor finishing from BIGAL2. Disappointed no signings, but understand why. Koeman has said he would not sanction McCarthy sale and Townsend must not have really wanted to come here or the deal would have happened. And 13/15million for him is way too much, even with the crazy prices at present. Some of the fans are clearly putting 2 and 2 together and blaming Ashley. If Rafa does walk, slating Ashley, I would give up my season ticket and not go back until Ashley sold up and left. If Rafa walks – but at the moment that is an ‘if’, so onwards and upwards for now, looking forward to tonight’s game! If Rafa walked and we ended up back at square 1, I wonder how many fans would still attend matches? Seems to me quite a few would just carry on as normal. There are plenty of ‘prawn sandwich’ brigade at SJP in my opinion! Put the bloody mobiles away, watch the game and get behind the team!!! If you look at his figures you can see why. Philip Cocu the Eindhoven manager seems to screwing his loaf with the 29 year old and not over playing him. He should have been given game time at the end of last season Jib, when he was finally fit and ready to play. His flair might have given us a win we desperately needed, but our manager saw fit to send out teams more suited to grind out a draw. And the rest, as they say…. Where was Rafa’s brilliant statement regarding transfers? All those idiots shouting about Rafa walking. If he was going to walk, he could, and probably would do so now. Stop speculating about a set of circumstances of which neither you nor I know anything about please, it’s getting very tiresome. He actually played in Rafa’s first 4 games with us ! He played a part in Mitro’s late equaliser against the scum at SJP. And the rest, as they say…. Rafa’s statement is enigmatic and my reading is that he’s not happy at the lack of signings, restating his experience in transfer dealings and dependent on the outcome of his proposed review of why the fruitless window (who does what and when and has control), where to next season and does he stay or does he go. Given the media reports concerning Ashley’s supposed views on transfers with regard to policy and who has greater influence (Carr), instinct tells me that dependent on that review, he’s saying he might walk unless he is allowed to manage in his way. But, being the professional he is, Rafa is focussing on games in the meantime. I wonder if you have ever heard of a team called Valencia. I am afraid you do show an enormous amount of selective ignorance on a frequently increasing basis. I get the feeling you’d hate to see us go up. It was a good window, we didn’t get mugged off by signing the likes of townsend. I honestly don’t get it, we by far have the best squad in the league and by some distance as well. If shelvey gets injured then rafa will need to change his tactics, Brighton don’t have a direct replacement for Knockaert but manage to cope when he doesn’t play. If we don’t go up with what we have then Rafa has failed to get the best out of his squad. We have the luxury of rotating players to keep them fresh unlike any of our rivals. Jeepers Lesh you really do talk drivel at times. (2) he said priority this window was a CM and winger (but we were to keep our mouths shut until the window was over about it)…. (5) a: most players will only drop down a division unless absolutely guaranteed game time, which he couldn’t provide…. @tfweeklypod 5 (b): any permanent deals would only be for players good enough for prem. Getting them in Jan almost impossible…. 6: He was hopeful of doing deals but realistic about how difficult it was. He told us not to expect too much. However…. 7: He did say that with Shelveys upcoming ban and the AFCON – he would like 2 players. We’re pretty much through that now so no harm done? 9: Maybe he is foaming and Ashley has pulled the rug from under him. All I’m telling you Is what happened…. 10: This wasn’t a bloke desperate for reinforcements. He was looking to get players in to improve the first team….that’s it though…. 13. Maybe the world is about to end. All opinions valid, we met a a bloke six weeks who had the same enthusiasm as when we did in August…. 15. Would be a travesty. Perhaps Andros Townsend has changed that, but until it happens, I’ll be backing him and the team 100%…. no one knows the full circumstances of why the townsend deal fell thru or any other player for that matter,except the club so until theres a statement from the club,if there is one… its all bull….lets just get back down to graft and win this league. ‘How happy are you with Lee Charnley? ‘How happy are you with Mike Ashley? ‘Are You Satisfied With The 2017 January Transfer Window? Oh, I needed to say “more” game time Jib, for you to get the point. Sorry, I do sometimes forget the level of intellect I’m engaging with on here. Of course I do talk drivel – all for your entertainment. Rotonda, one swallow doesn’t make a Summer. Plenty of dud managers have jagged a success or two to put on their CV. McClaren being an example you should recall, I imagine. Supporters of his last three clubs wouldn’t urinate on Benitez if he was on fire but you lot conveniently ignore that. Well the reason for no McCarthy is Koeman saw a “long term future” for him at Everton. Simple. And I personally think no Townsend was simply because palace didn’t want to loan, we could have paid the release clause straight away which would have been anywhere between £13-15million then it would have been up to andros to decide, but even at that price tag I’d rather have loaned him than bought him straight away. But still we can do much better in the summer IF we continue the hard work and the boys stick together and the fans really get behind the team. Let’s go and win this league. You suffer from hypersensitivity if you picked up my suggestion as being rude rather than helpful. Glad I found another one like you that talks sense. James Toon – Seems Koeman blocked McCarthy, so that was that! Am wondering if it was Andros who was not too keen on the weather up here, the wages or just not keen on another loan? Haggling over a loan deal for Townsend on the last day of the window – is that the best they could do to support the manager? Those praising prudence had better hope that the side’s form over the last 10 games isn’t carried into the rest of the season. Our interst in Townsend may have caused the resurrection of his career under Fat Sam. Pretty sure Townsend was played just to stick a finger up at Rafa. JIB, your training pics have helped the line up! No Diame hidden in those snoods? Jib @ 36, I may well have been, but it’s more likely to do with Zaha not being particularly fit after AFCON? James Toon – Was tapping in the BINGO lie-up, so did not copy!! Great minds, and all that!